Winter Solstice Card 2012 - BrainstormOverload - Small design studio. Big ideas. After today every subsequent day will enjoy a few more minutes of sunlight as we rotate inexorably back toward the planetary orientation we like to call “cycling season”. 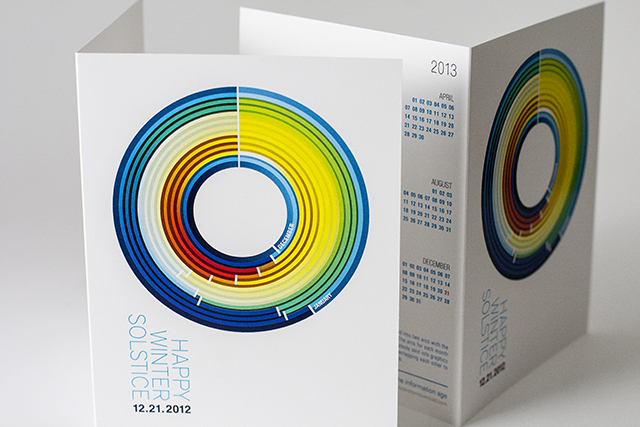 Just in time to celebrate (it’s been a very busy year) we’ve finished this years winter solstice Info graphic card. We’re excited to deliver them to our incredible clients whom we appreciate very much (it’s been a very busy year). It’s also become a tradition to provide a print quality pdf for download, so we did. We’re all in this thing called Winter together after all and we really appreciate the requests we get every year. So, with that stay warm and enjoy. 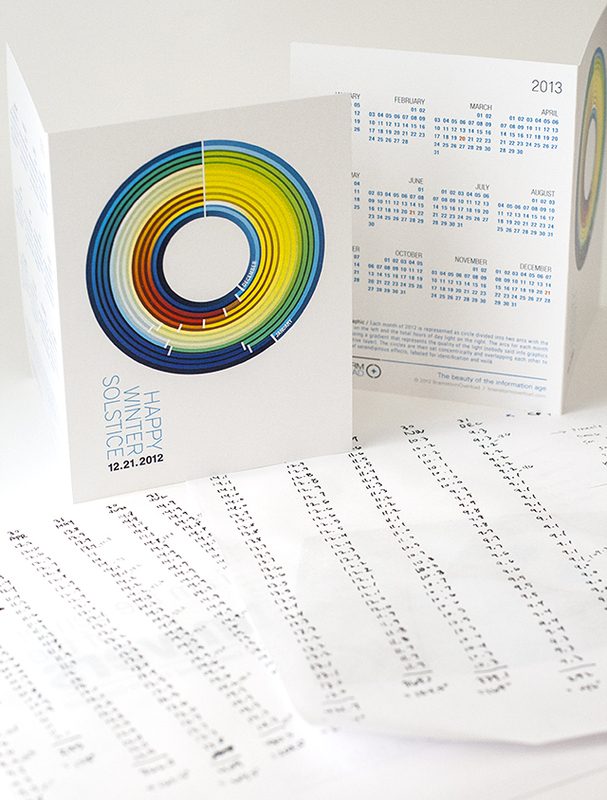 For this year’s graphic each month of 2012 is represented as a circle divided into two arcs with the total hours of night on the left and the total hours of day light on the right. The arcs for each month have been colored using a gradient that represents the quality of the light (nobody said info graphics can’t have a subjective layer). The circles are then set concentrically and overlapping each other to cause the creation of serendipitous effects, labeled as minimally as possible and voilà. We should add that these are the product of a completely manual process. We add everything up by hand, rotate all the angles one at a time in Adobe Illustrator and adjust all the details until we’re happy with them. Probably “there’s an ap for that” but we enjoy spending the time with the design. Check out cards from past years.